More than eight years of annual increases in the average sales prices for retail and apartment properties are likely to end in 2019, even if the U.S. economy dodges a recession to reach its longest expansion, CoStar analysts said in a webinar forecasting trends for the coming year. 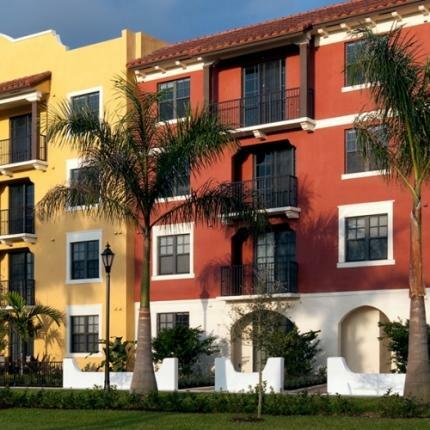 Deepening pain from retailer bankruptcies and store closings, combined with recent increases in interest rates and more apartments coming on the market, could contribute to declines in the average sale prices of retail and multifamily property in the coming year, said CoStar Senior Consultant Andrew Rybczynski. The price decline was among more than two dozen predictions offered by CoStar‘s analytics teams on the economy, capital markets and U.S. real estate property markets for the coming year. Michael Cohen, CoStar‘s vice president of advisory services, said 85 percent of his group’s forecasts turned out to be correct last year, including predictions that construction costs and project delays would increase this year and e-commerce would contribute heavily to demand for logistics and other industrial properties. Despite slowing global growth, Cohen said, he expects the U.S. economy to dodge a recession next year and for the economic expansion to become the longest on record since at least 1945 amid wage growth and relatively low interest rates. While the economic expansion is on track by July 2019 to be the longest in U.S. history since the 1850s, when the government began tracking growth, economists in their analyses often focus more closely on the stretch since 1945 when more comprehensive data began getting collected. In another prediction, CoStar Analytics consultant Robin Trantham said that contrary to the concerns of some market analysts, tech markets “will avoid falling off a cliff” in the coming year. Tech companies have been some of the most prolific occupiers of real estate this year. The strength of the office market is one reason CoStar‘s forecast calls for average sales prices of office properties to keep rising gradually during 2019. Industrial properties are expected to benefit from the explosive growth of the e-commerce industry, led by Amazon, and its need for storage and last-mile delivery. However, the effect of several increases in short- and long-term interest rates, rising construction and building completions and changes in consumer shopping trends have had an adverse impact, particularly on retail and apartment investments. CoStar analysts predict that sales prices for major property groups will start to level off in 2019. Retail sale prices have already begun retrenching among malls and shopping centers at the very top of the market, which experienced pricing spikes a couple of years ago as investors raced to snap up the highest-quality and best-located properties, Rybczynski said. However, analysts expect the declines to spread in the coming year as shopping center landlords become less confident in their ability to raise rents and increase their income, with many retailers facing pressure on brick-and-mortar sales from e-commerce and and other changes in shopping behavior. Rent growth all but disappeared for owners of the highest quality apartment properties during 2016 and 2017 as developers churned out record levels of new apartment units. Although construction delays from rising labor and materials prices allowed rent growth at top-quality properties to resume in 2018, continuing high construction levels are expected to cause overall apartment pricing to decline next year, Rybczynski said. He also predicted that office and apartment investment capital will generally favor smaller, non-core commercial property markets next year. The percentage of total sales volume in Chicago, Los Angeles, San Francisco, New York, Boston and Washington, D.C., properties is expected to decline as more investors react to flattening and declining returns by seeking yields in smaller secondary markets bolstered by stronger population and job growth than large cities. “We predict that pricing at the absolute top of the market has gotten rich enough that a shift away from core markets will happen in 2019, particularly in the multifamily and office markets, which tend to be more susceptible to trophy asset pricing,” Rybczynski said. Paul Leonard, CoStar managing consultant, went on to predict that one of the runner-up cities in Amazon’s high-profile second headquarters search would land a major company expansion or relocation next year. His top picks include Atlanta, Dallas and Denver. Amazon chose Arlington, Virginia, and New York City as locations to split its second headquarters, while planning to put a logistics hub in Nashville, Tennessee. CoStar also predicted that average capitalization rates, the projected rate of investor return on a commercial property sale based on the income it’s expected to generate, will rise only slightly next year. CoStar does not expect the spread between capitalization rates and 10-year Treasury bond prices, which now stands at around 1.6 percent, to tighten much more in 2019. Narrowing spreads between bonds and capitalization rates amid rising interest rates typically point to lower returns for commercial real estate investors, especially for prime properties in large cities as rent growth slows. For example, the gulf was just 0.5 percent at the peak of the real estate boom in 2007, when investors were paying record-high prices for offices and other buildings as the U.S. descended into the Great Recession. 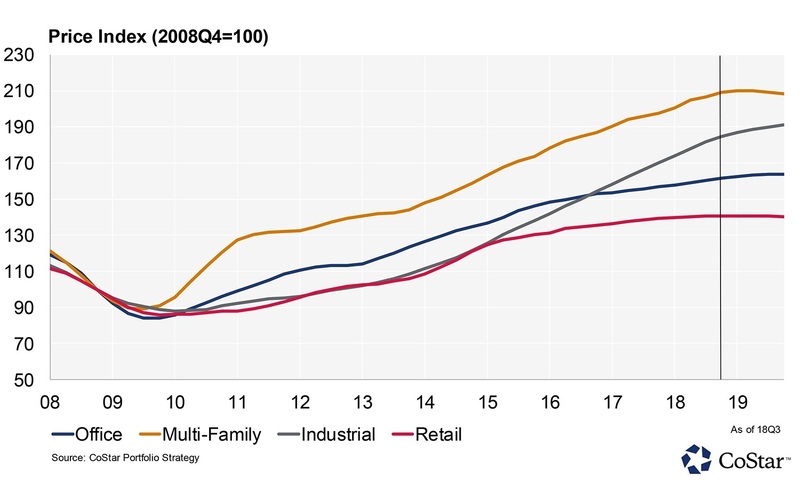 “Despite yields hitting new lows, commercial property remains competitive relative to other asset classes and continues to attract investor interest,” said CoStar consultant Juan Arias.